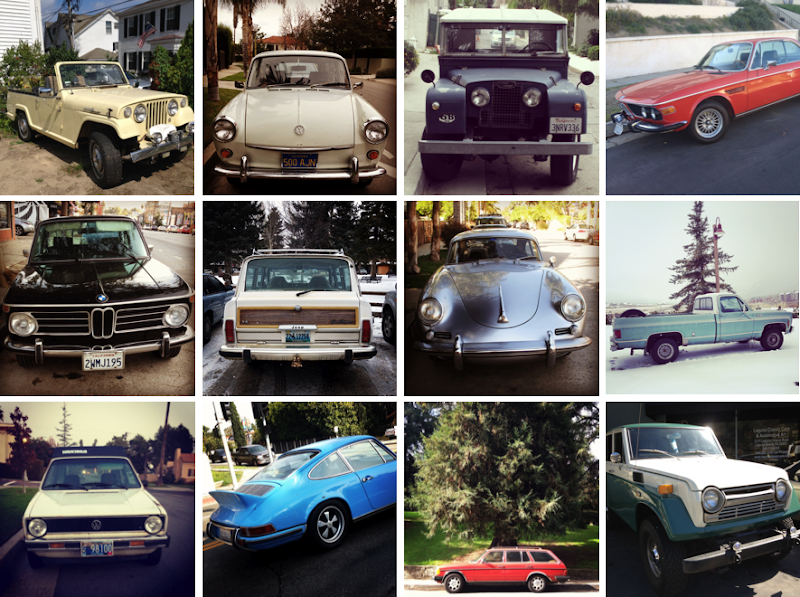 I've always loved vintage cars, but since getting on Instagram, spotting them has become a real hobby. I don't know if they're all around me now or if they always have been, but I see them everywhere. I'd love to own one one day, but for now the photos will do. What are your favorite vintage cars? I'd love to know so I can keep an eye out for them. Ford Broncos, International Harvester Scout, MG Midget, the list goes on! Awww!! The bmw 2002 is my dream car. But any vintage Volvo is awesome as well. They're harder to find! Love an old motor. My brother has a 60s Mustang. It's fab. I own a red 1957 MGA Convertible. I love to sport my British driving cap, and dream I'm cruising down the narrow winding roads in the English countryside. My daughter caught the vintage bug, and has a Miami Blue 1977 Volkswagon Rabbit diesel. She was sad when she went off to college and left Rosie behind. I wasn't because now I can take her out for a spin anytime! Vintage Saab 900 and my old '91 Landcruiser that I had to sell a couple of years ago. Navy 1985 Mercedes 300D. I am actually selling one in Texas right now, sadly. Fav car ever. WOW! Love these cars. I used to drive a '76 Nova in firestorm red. It had a huge engine but was an under the radar muscle car. I wish I never sold it; I bet the 17-yr old that bought it from me picks up tons of chicks with it. Any old vintage Volvo! You can't beat them. 1967 jeepster commando! we have 2 and my boyfriend is working at rebuilding one at the moment! Married a man with a serious 'thing' for vintage Italian cars.. his current is a 1969 Alfa Romeo GTV. Ah, for the smell of petrol and prosciutto on a Sunday morning drive - heehee. Looks like you've got a thing for round headlights too. I like this car. so beautiful is. I've been lusting after that red BMW down the street myself! For me, any muscle car and a Volkswagen bus! The Volkswagen bus always reminds me of the Mystery Machine, which I really love. It’s so old school and I can bring it everywhere, especially when going to the beach. You should definitely check this out or a muscle car! I have a 1972 Volkswagen Karmann Ghia convertible - I've loved Ghias from the beginning - the 'poor man's Porsche...' They are rare - and a sighting (particularly here in rust-inducing New England) is an exciting event! A Ford Ranchero 1979 would be my favorite. I don’t own one, my Grandpa does. But I get to drive it sometimes, and that’s cool for now. I’m still planning to own a vintage car, though. Anyway, these photographs are amazing! Seeing a vintage car on the road always makes me stop and stare until it’s out of my sight. I don’t know, but there’s some sort of magic in them that gets me all the time.